Declarations in register reveal few details on judiciary. 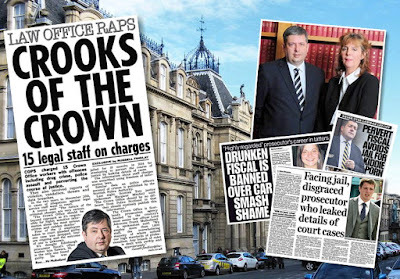 THE LATEST declarations by a select few powerful judges who control the running of Scotland’s Courts – is more revealing in what is missing from the limited disclosures in the latest annual report of Scottish Courts and Tribunals Service (SCTS). 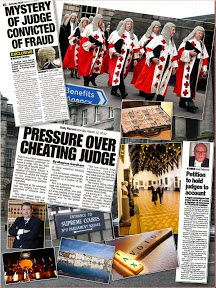 Ruling over our courts in their ermine robes - in some cases decades longer than any Prime Minister could hope to remain in office – the handful of judicial declarations after years on the bench and millions in taxpayers cash - are even in some cases even less than newly minted msps cobble together in their first few weeks at Holyrood. 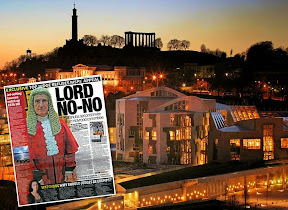 This year, Scotland’s current top judge, the Lord President & Lord Justice General - Lord Carloway – (real name Colin Sutherland), has but one declaration (Trustee, Scottish Arts Club) – dwarfing the vast listing of directorships & positions of his predecessor – Lord Brian Gill. 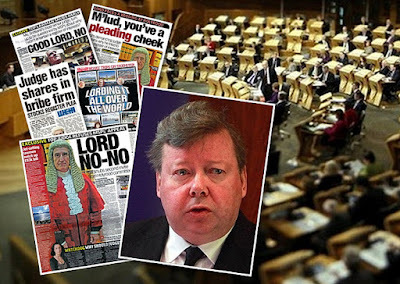 Lord Carloway (62) was appointed to the Court of Session since 2000. Sixteen years later, and now in the top job – his salary is currently listed in the UK Government guidance on judicial salaries as of 1 April 2016 as £222,862.00. Another judicial member of the SCTS Board - Lady Smith (61) was appointed to the Court of Session in 2001. Fifteen years later, her salary as a judge of the inner house of the Court of Session is listed by the UK Government as £204, 695.00. 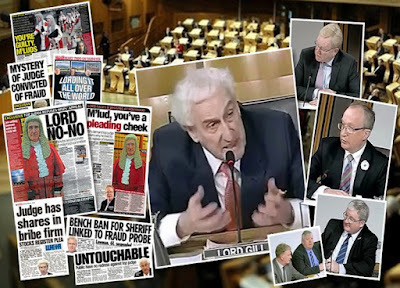 Lord Brian Gill (74) - appointed to the Court of Session in 1994, ‘retired’ from his judicial tenure in Scotland as Lord President 21 years later in June 2015 - on a salary of £220,665.00. Lord Gill’s roll of directorships fill out a page on their own, yet you get the feeling his name was only included in the 2016 version of the register to leave in some detail , mainly because if Brian Gill’s long list of interests were missing – as they should be, given Lord Gill left the role before the September 2015-16 period covered by the register - there would be little to read of the rest. Far from being retired, Gill is still a judge, only now based at the UK Supreme Court in London, and is scheduled to hear a tax case appeal involving Volkswagen Financial Services (UK) Ltd (Respondent) v Commissioners for Her Majesty's Revenue and Customs (Appellant) in November. 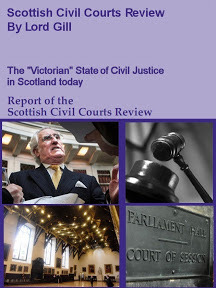 Compared to registers of interest which apply to other public servants including elected politicians, the three Court of Session senators, three sheriffs and a Justice of the Peace declare – as the Judicial Office for Scotland will tell you - only what is required in terms of the rules – rules written and approved by, themselves. A bit like you writing the rules of your own tax return or register of interest. Think on, for a moment. If you wrote the rules, what would you pay in tax or declare as interests in a register? Right. Now you understand. 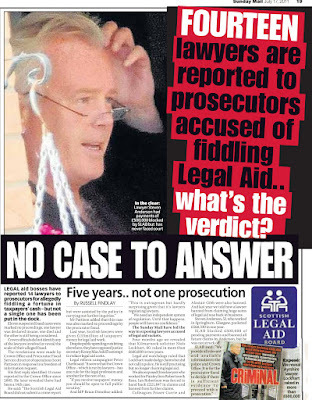 Comparing these ‘declarations’ with judges long legal careers and glowing biographies complete with not one hint of hardship, scandal, financial loss or deviation from a perfect business record – there is little trace of the millions of pounds of public cash paid in judicial salaries over the years. And this is one of the blanks in the life of the judiciary which raises questions on what judges are so hostile about declaring in a fully published register of interests. Put it this way - If you were paid around £200,000 public cash (and not forgetting pension perks) for ten or fifteen years, picked up work along the way and positions on powerful quangos, you could imagine picking up a few interests, properties, and so on over the years. Life would indeed, be a jolly. There is, for example no trace of declarations which appear in registers required by other public sector workers – such as hospitality, paid outside work and other earnings, jobs, consultancies, speeches, connections, you name it they do it, and of course, the big one – property. Lord Gill owned a plush £1.7m Victorian mansion in Edinburgh, yet not once in any version of the register from 2012 to now, did said mansion or at least a property value ever appear. The same is true for all the other judges who have come and gone on the now renamed SCTS Board register. Property? forget it. This paltry register for a few judges is not the place for transparency. The lack of detail in someone’s life in terms of interests, and assets – is, perhaps as any HMRC investigator or clued up person may come to realise .. inconsistent with the subject’s receipt of significant sums over the course of time. Reality Check. 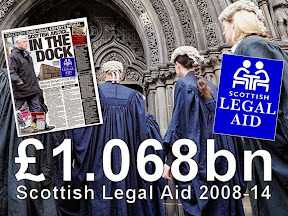 £40 million in public cash (along with any unlisted extras in that ever so dodgy Scottish budget) is lavished on Scotland’s judiciary every year. 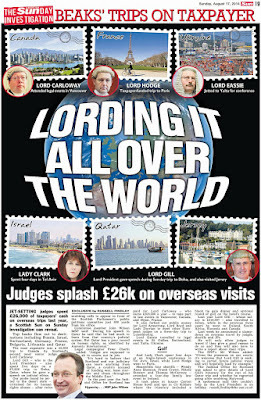 £220K a year for just one judge - for years, well connected, investments, art, properties as grand as a Prince and more international travel junkets than James Bond. Yet when the judiciary are asked questions about their interests, and to explain why their position is judges should not declare their interests like everyone else - every response ends with a carefully constructed threat, given out in a public arena, with no shame. From shares in bribes companies Sheriffs to private banks & hedge funds, and big wigs with big wings, little trace exists of the enormous sums of public cash and where it goes. This seems a little unfair – for a collection of people who, at the swish of a pen, can change your life as you know it, public life as we know it, strike down legislation from our parliaments, or shut off your child’s life support – or even yours – if you have no one to speak for you. Thus, the case is easy to present why those with the most power, must feel the full weight of transparency even more than the rest of us. Not rocket science, is it – M’Lud. 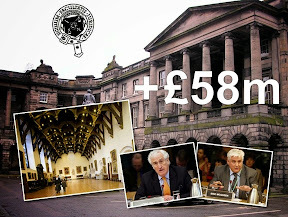 Compare – if you will - the judiciary’s £40 million or more a year and every year - to msps who may find themselves ordered to pay back hotel expenses. 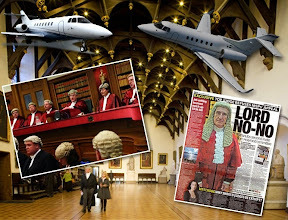 Unpleasant for some, isn’t it - while a judge pitches up, demands a £5K bag of public cash to fly off to some mystery law conference at the other side of the world, everyone else must account for the last penny, and declare all their interests or face the possibly of an appearance in front of a judge who does not adhere to such indignities as transparency. Anthony McGrath: (from 1 April 2015 to 31 December 2015) Saltire Taverns Ltd, Consultation and mentoring assignment with Cantrell & Cochrane PLC. This includes sitting on the commercial Board of a subsidiary called The Shepton Mallet Cider Mill based in Somerset. 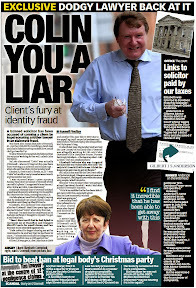 President of Scottish Tribunals - Rt Hon Lady Smith: Artemis Fund Managers, Barclays, Blackrock AM, Brown Advisory, Goldman Sachs, Global Access, Henderson Investment, Ishares PLC, JP Morgan, Lazard Fund Managers, Pimco Global, Vanguard Funds PLC, Fundrock Management CO Gsquaretrix. Johan Findlay OBE JP: Aviva, Vodaphone, Santander, Unilever, Norwich Union, Legal & General, Fidelity Funds Network, Lloyds Banking Group, Thus Group, HBOS, Trafficmaster, Standard Life. Lord President – Rt Hon Lord Gill (note: Lord Gill retired on 31 May 2015 and was succeed by Lord Carloway). :Henderson UK Growth Fund Retail Class Acc, Newton Global Equity Fund, Aviva Investors UK Equity Fund, Scottish Widows UK Growth Sub-Fund, HSBC Balanced Fund (Retail Acc), Royal Mail Plc, TSB Group Plc, Urban and Civil Plc, Vestry Court Ltd. 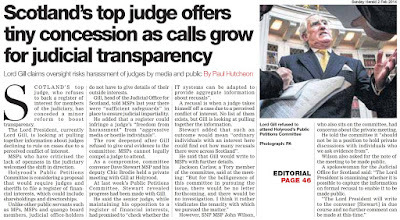 In an effort to bring greater transparency to Scotland’s judiciary - Petition PE1458: Register of Interests for members of Scotland's judiciary - first debated at Holyrood’s Public Petitions Committee in January 2013 – calls for the creation of a publicly available register of judicial interests – containing information on judges’ backgrounds, figures relating to personal wealth, undeclared earnings, business & family connections inside & outside of the legal profession, membership of organisations, property and land, offshore investments, hospitality, details on recusals and other information routinely lodged in registers of interest across all walks of public life in the UK and around the world. 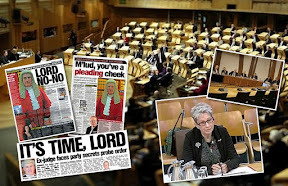 A full debate in the Scottish Parliament’s main chamber was held at the Scottish Parliament on 9 October 2014 - ending in a motion calling on the Scottish Government to create a register of judicial interests. The motion was overwhelmingly supported by MSPs from all political parties. You present a very persuasive case for a register of judges interests.Very persuasive.I cannot think of any acceptable argument against your petition.Not one! So in other words dont let judges write the rules governing how they declare their interests because you end up with this so-called register of the Scottish Court Service glossing over who fails to declare. Only a matter of time before this catches up with Carloway and Gill. As you say years even decades on the bench and millions of pounds later then only a single declaration or a meaningless list with scant detail and threats to anyone who dares to ask a question in parliament. Not acceptable in 2016.The judiciary are an affront to decency and democracy. "This seems a little unfair – for a collection of people who, at the swish of a pen, can change your life as you know it, public life as we know it, strike down legislation from our parliaments, or shut off your child’s life support – or even yours – if you have no one to speak for you. Thus, the case is easy to present why those with the most power, must feel the full weight of transparency even more than the rest of us. Not rocket science, is it – M’Lud." Correct.The lack of property or as you say values attributed to land or property is a stand out omission.You can find plenty references to property in msps and mps registers of interest.Zero declarations from the judiciary smacks of something to hide. Good comparisons there Peter and surely this is not very good for justice to have judges rattling around the courts for 16 years or even 24 years in the case of you know who. Time for a full reconsideration of this job for life the judiciary have made for themselves. I dont care who it is but common sense tells you a judge or anyone else earning over £200,000 a year and nothing to declare especially a house or whatever does not fit in with how people live and go about their daily lives. 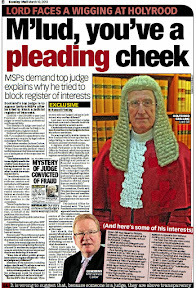 Gill just sat there giving evidence knowing he has a £1.7m house says nothing about his other interests and still demanded msps close your petition as a sign of faith in the judiciary.What a scandal.How can anyone believe judges is beyond me. Good point, the longer judges serve, the higher the chance they meet themselves coming round the corner from case after case they or their relatives have previously ruled on. 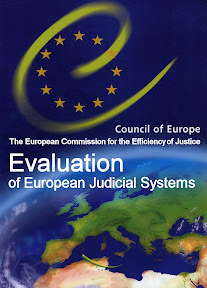 A 12 to 15 year term limit at most, would be good for the justice system, combined with a much more accountable regulator, independent oversight and an open process of recruiting and appointing judges - with sessions accessible to the Scottish Parliament and public as occur in the selection of US judges, rather than judges appointing themselves and their pals to the bench as we have for the past 500 years or so in Scotland. 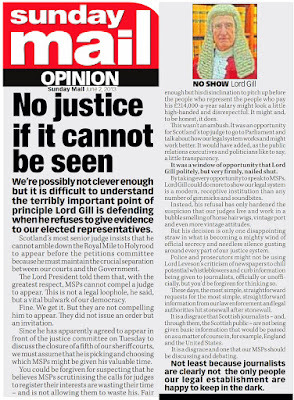 Gill is sitting in the Supreme Court hearing a tax appeal?Haha this will be interesting the judge who threatened msps about your register hearing a tax case!How about a recusal LG! Term limits Here Here! about bloody time someone suggested this for the judiciary and likewise in England. Having a judge "rattling around the courts" for 24 years is nothing to be proud of in a modern democracy. 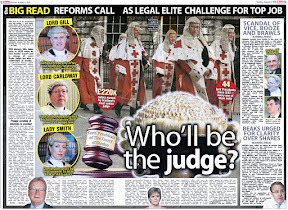 As Peter quite rightly suggests the judiciary should be cycled on a regular basis to keep judges in tune with society instead of the current dictatorship so spectacularly outed by the petition where Gill and his cadre of judges all ganged up on Parliament and the press for daring to call for a register of interests. Term limits for judges great idea and thanks for those links! get your teeth into that one Peter! 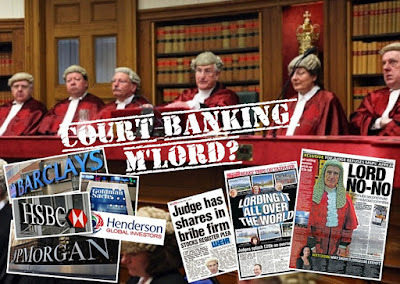 Plenty banking interests the judges obviously dont want us to see because that list is not in the court documents only on your blog. If they want to be bankers they should bugger off and be bankers instead of pocketing our public cash and waving the bankers on with a wink whenever they are up in court. 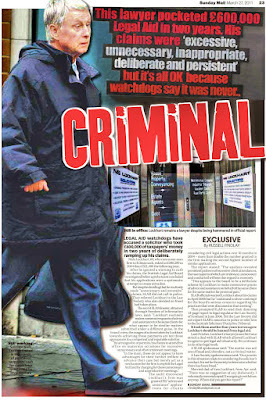 Why do they have Lord Gill's interests all over that document and he isnt even in the photograph of the board members? 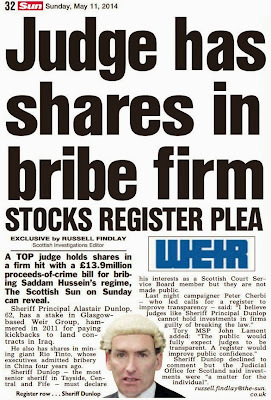 Where are the amounts of those shares and why are the figures not released instead of only the company name?Very odd.They could have 5000 or 50000 shares in one of the banks and this is bound to have an influence on any judge hearing a case involving any bank or related company not just the one where they have shares in. The amounts of shareholdings and values have to be disclosed in your register they are looking into at the parliament as well as the property and other earnings you mention. Scotland seems a little too much trouble from what I am reading here and nothing is achieved unless some antique judge decides on whatever is in his own interests. Weird state of affairs for a country with designs on independence. If you think the discussion on the interests register is tough try talking term limits to the judicial monsters who regard themselves as in a job for life! If we eventually gain your register of judges interests there needs to be a complete reform of the judiciary. This dictatorship has gone on long enough and the way they handled themselves and the debate around your petition proves time has come to clean up the judicial monster who answer every point put to them with threats and bullying.Anyone who replies to reasonable questions in the way Gill did at parliament and all those letters from the judges is patently obvious they are desperate to hide something and the only subjects causing so much concern to those with something to hide is money and the influence/power connections that go with it.You really hit the nail on the head with the register petition you only need to watch angry Gill banging away to the msps on every word like he was sitting in court instead of down the road.No one gets so angry and telling them to stop asking questions unless they have something to hide.If you can find a non bent copper they will say exactly the same and four years is long enough for msps to act and pass the register into law and make it tough like everyone else not some sloppy joe register like this one you published with the judges writing the rules themselves and declare nothing. More than 100 BBC presenters are under investigation for alleged tax avoidance after being suspected of wrongly using personal service companies to minimise their tax bills, HMRC has revealed. A “very significant number of BBC news presenters” – as well as a number of staff at other broadcasters - face demands to hand over unpaid tax and national insurance contributions after HMRC launched a probe into whether stars had incorrectly declared themselves to be self-employed. The BBC announced in July that it had moved 85 presenters onto its books as full-time employees, after a report published in 2012 found that the corporation paid more than 124 stars in excess of £150,000 a year via personal service companies. Stars such as Jeremy Paxman and Fiona Bruce have previously been paid via their own service companies, although there is no suggestion that they are suspected of any wrongdoing. The new revelations are included within a tax tribunal judgment involving BBC newsreaders Tim Willcox and Joanna Gosling. The pair are appealing against a ruling by HMRC that they failed to pay enough tax during years in which they claimed they were not employed by the corporation, and were instead paid via their personal service companies. A hearing at the First Tier Tax Tribunal, in July, heard that HMRC began investigating 23 BBC presenters in May last year, to establish whether they had fallen foul of IR35 rules, used to determine whether workers should be taxed as employees, or are self-employed. Evidence provided by Jennifer Henderson, the BBC’s head of global mobility and employment tax, shows that the corporation was informed in autumn 2015 that the number had risen to 100. The BBC, which failed in an application to give evidence in the case, said in its submission: “HMRC have indicated to the BBC that there are around 100 additional cases under consideration involving current or former BBC presenters. “The BBC also understands that HMRC has initiated or indicated their intention to initiate IR35 proceedings in relation to presenters who are engaged by other broadcasting organisations. A BBC spokesman said that the “industry wide issue… affects those who have been engaged in this way for a number of different organisations”. The spokesman added: “The exact number of cases that will be taken forward will be determined by HMRC. This particular tribunal relates to tax issues between 2006 and early 2013 and not the present day. Willcox and Gosling refused to comment. 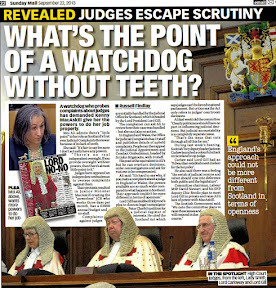 you are correct I just realised after reading your comment why is Gill in the register and not in the photograph because I remember Peter did the report on Gill walking off the job last year http://petercherbi.blogspot.co.uk/2015/05/lord-no-no-to-go-go-scotlands-top-judge.html Lord No No to Go Go! 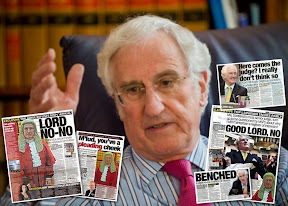 also this http://petercherbi.blogspot.co.uk/2015/05/you-ran-mlord-departing-top-judge-gets.html You ran M'lord! Only reason I can see they have Lord Gill on the register now is because he declares a lot compared to the rest and thinking about what Peter said in this latest post with the judges being in their jobs for so long and all that salary this version of their own register makes no sense. Gill probably had to declare all those charity positions because they are well known charities and you cant be anywhere near something like that without people taking notice and the word getting out so compare his to the others and their register breaks down. 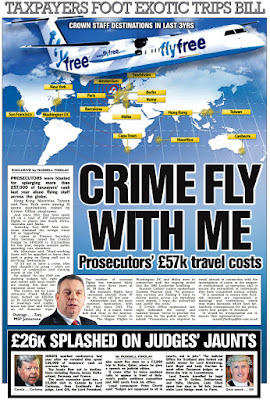 As Peter says there are no details of any property or work and other things they must do when not sitting in court because the court job is hardly 24 hours a day 7 days a week when they are flying all round the world and never in court when you need them. Cases go on and on in the Court of session for years because the judges are never there or in recess or they are off somewhere on another perk or different job and the lawyers are happy to string their clients along because they get more fees for the work while the judge sits in the sun or in one of his homes not declared on the register. Imagine if an mp after 16 years of service declares he has a painting and nothing else.The press would be all over him like flies and big headlines for weeks on hidden homes secret lovers expenses everywhere and everything else but because the judge says they dont need to declare we get zip from them and we have to rely on the good decent members of the press to get this story out. lol perhaps Miss Jean Brodie will come to the Lord President's rescue. After all she did admire the fascists and say "If I were to receive a proposal of marriage tomorrow from the Lord Lyon King of Arms I would decline it"! 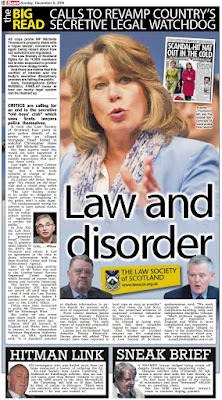 "Compared to registers of interest which apply to other public servants including elected politicians, the three Court of Session senators, three sheriffs and a Justice of the Peace declare – as the Judicial Office for Scotland will tell you - only what is required in terms of the rules – rules written and approved by, themselves. Put it this way - If you were paid around £200,000 public cash (and not forgetting pension perks) for ten or fifteen years, picked up work along the way and positions on powerful quangos, you could imagine picking up a few interests, properties, and so on over the years. Life would indeed, be a jolly." Makes sense - They are writing their own rules so only need to declare what they want to and here we have the result NOTHING TO DECLARE! Good comment from Chic Brodie on the shareholdings of Gill and all the judges opposed to your register of interests and he is correct there should be rules for all judges to declare all their interests including property and everything else. Chic Brodie, an SNP MSP, said: "This shows there is no consistency. There should be a consistent set of rules across the judiciary." 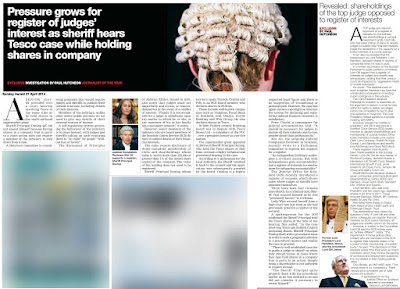 A top judge and staunch opponent of a register of interests for the judiciary has shareholdings in several investment funds. 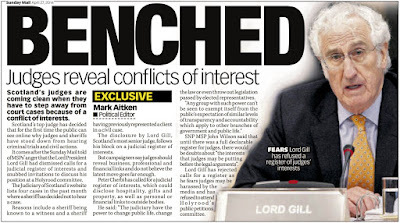 Lord Gill, who has been critical of plans to require judges to publish their financial interests, made the declaration in his capacity as a board member of a courts quango. It can also be revealed that his predecessor as Lord President, Lord Hamilton, declared shares in dozens of companies when he was in post. 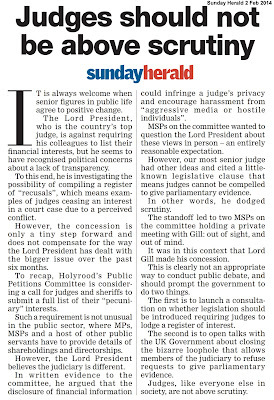 In a written submission to the Scottish Parliament's public petitions committee, Lord Gill argued that a register of interests for judges and sheriffs was unnecessary, adding that their privacy could be impacted by "aggressive media or hostile individuals". He wrote: "The establishment of such a register therefore may have the unintended consequence of eroding public confidence in the judiciary." 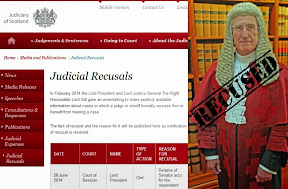 The Lord President declined Parliament's invitation to elaborate on his argument in person, a snub he was within his rights to deliver as judges cannot be compelled by law to give oral evidence to Holyrood. The Lord President instead agreed to a private meeting with MSPs. 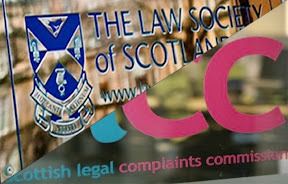 However, despite his hostility to a register, Lord Gill is required as a Scottish Court Service (SCS) board member to declare shareholdings and membership of outside bodies. Other board members include Lord Justice Clerk Lord Carloway, Sheriff Principal Dunlop, Lord Bannatyne and sheriffs Iona McDonald and Grant McCulloch. These registers have recently been made available to the Sunday Herald. 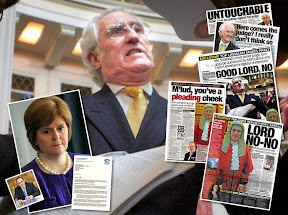 Lord Gill, the de facto leader of Scotland's judges, declared shares in Henderson UK Growth Fund, Newton International Growth Fund, Aviva Investors UK Equity Fund, Terrace Hill Group and Vestry Court Ltd.
Sheriff McDonald declared shares in seven companies: pharmaceutical giant GlaxoSmithKline, banks HBOS and Barclays, Royal Dutch Shell, Standard Life, Unilever and Equiniti. Lord Hamilton, who was Lord President until two years ago, registered shares in 33 firms in 2011. These included Barclays, BSkyB, BP, Centrica, Nestle SA and Rio Tinto. Also listed were shares in Statoil ASA, National Grid, HSBC bank and Edinburgh Dragon Trust. The declarations have raised the question of why, if Lord Gill and other senior colleagues can register financial interests as SCS board members, all judges and sheriffs cannot do the same. However, in a letter to the Committee, Lord Gill said the SCS entries were an "entirely different" matter. "The requirement of those judicial office holders who are members of the SCS to register their interests arises in the context of their membership of a public body," he said. "The disclosure of their interests arises from their work as board members, which may involve the placing of contracts and employment questions. It is not related to their holding judicial office." 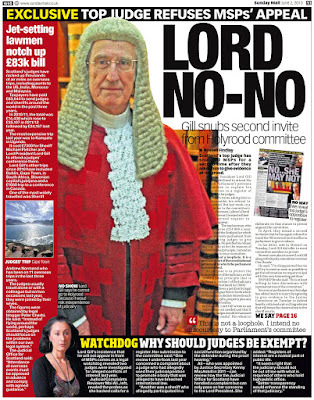 A spokesperson for the Judicial Office for Scotland declined to comment beyond Lord Gill's letter. 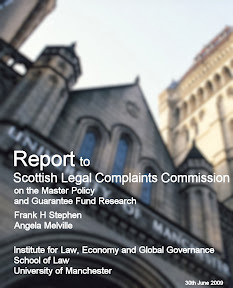 Quite an education reading this blog.You never see this kind of detail in the 'dedicated' legal websites run by Law Society lackeys.The one you did on the Crown Office corruption and drug dealing is a real blaster.The PFs and Lord Advocate should be hauled up in front of parliament to answer for this. Personally I back term limits on the judiciary although how you go about implementing such an idea in Scotland will take a lot of doing. 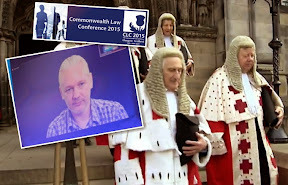 I can think of several judges in the Court of Session who no longer trouble to conceal slights against certain legal representatives,clients and cases they do not wish to be heard. Term limits and wider reform of the judiciary will help to cycle out judges who become embittered over the years including those at the top with a big chip on their shoulder against rights of the accused to be equally represented and continuing plans to remove corroboration. This is what happens when judges are allowed to write their own rules and look at the mess they create.Their own worst enemy. 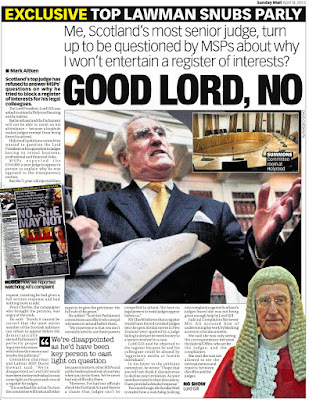 I dont believe Gill's interests were included in this register without his agreement whether he is still on it or not.Just another chance for judges to say they declare when they dont.That entire register is a joke made up on the back of a fag packet.This is the same judge who wanted msps to go for his recusals list and leave it well alone then the Professor shot recusals right down as you already wrote. and another thing I forgot to mention if Gill is retired why are all his interests at the top of the list instead of at the end.He is supposedly off to London and out of it so again just another sham by the judiciary to say they declare when the reverse is true.The entire list of charity work and directorships is nothing compared to the other shares list you published and note the shares are carefully kept out of the annual report along with property and the rest. Goes to show the judges are a pack of liars and this is no accident the whole thing carefully cooked up at taxpayers expense in a glossy annual report full of lies. Anyone fancy having a tax case heard by a judge who foamed a the mouth when asked about a register of interests?No takers? Thanks for the good read and a desperately needed non flattering story about our lords and masters as they prefer to be known. I say you must not win an unjust case by oaths. Aeschylus. 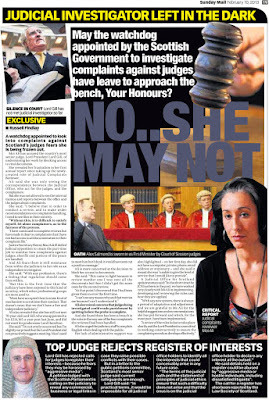 How convenient writing your own rules and leaning of the Judicial Oath Mr Gill was on about. Oaths and writing your own rules is utterly corrupt and stinks. Imagine everyone telling the Inland Revenue we want to set up a taxpayers Oath, that we promise we will pay the right amount of tax without them being able to check how much we earned. 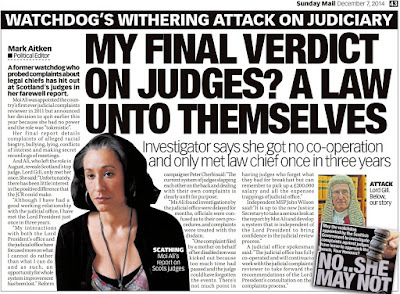 Why should Judges be allowed to operate on their Oaths to the public they are above board and honest, it beggars belief, they can make decisions about members of the public with impunity. Now that is corrupt power. Quite an education reading this blog. You never see this kind of detail in the 'dedicated' legal websites run by Law Society lackeys. 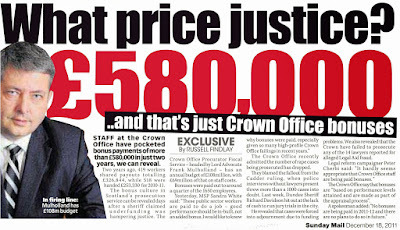 The one you did on the Crown Office corruption and drug dealing is a real blaster. The PFs and Lord Advocate should be hauled up in front of parliament to answer for this. Parliament (ha ha) no disrespect intended are the same as the Law Society, they are all a faction of crooks as you will know if you have ever tried to get justice against them. I tried and found out what many others have. There is no complaints system. Oh you can complain but they will shut you down, they are a bad lot. 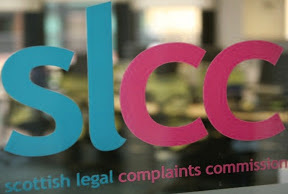 The reason there is no complaints system is because they all write their own rules and some are unwritten, they just look out for each other which is why no lawyer will sue lawyer on your behalf. 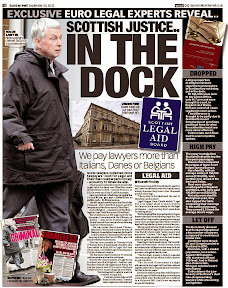 They hold a monopoly in terms of who has access to justice and lawyers victims never do. Interesting post and the comments also your links on the Term Limits for judges.I agree they should only serve so long in a judicial capacity.Male the retirement age 65ish at the most otherwise the same judges will be in the same jobs forever. Couldn't help notice the topic strayed quickly from interests to term limits. Suffice to say keep up the good work! Gill stepped down before DOI found out too much. Supercilious twit. That is how you get round democracy even when public money is involved. Set up a system that benefits themselves where they are able to operate in secrecy. It is nothing short of a scandal that in this day and age these people need don't want to be accountable or change their ways. But I am not surprised by the attitude of many MSP's either because they want to keep this rotten corrupt system the way it is, perhaps even protect judicial interests more. 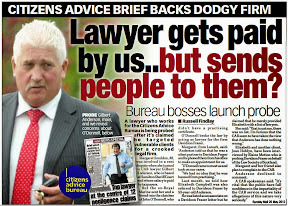 They must detest you Peter for your petition but I think it is brilliant and DOI keep up the excellent work. They are benefiting greatly the way the system is, an obvious point I know that is why we hit a barrier of resistance because we want to change it. These Judges have no power to keep them in awe, which just proves what Miss Ail said, they are a law unto themselves. Some system where a litigant has lost their case before it is heard in court, that is of course if the lawyers don't dump them before the case is heard. Mr Gill we have no confidence in the judiciary, if you were a party litigant would you trust the judiciary who have many financial interests in companies, would you not see the conflict of interest? It's has nothing to do with confidence being lost in the judiciary or aggressive media or hostile individuals. The real reason you do not want a register is the obvious one, you judges must have a lot to hide. 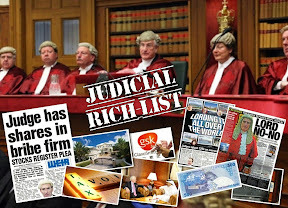 At the rate the economy is collapsing due to Brexit the judges will be busy smuggling their cash and loot out of Scotland and making sure their property is a wholly owned subsidiary in the Caymans! Oh yes total hypocrisy as slippery as a Conger Eel he will put forward any excuse. The first law of civilization he does not mind transparency but not for his faction who are a law unto themselves. His arguments are weak and preposterous. the stand out is the solitary declaration of..
Is it my imagination or are judges engaging in a little public pr due to your petition and the fact they are now exposed as a pack of lying you know what! 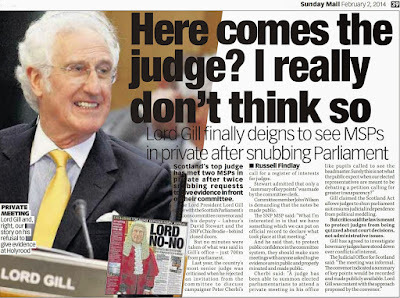 Lay off the fruit loops Mr Gill no one trusts the judiciary. Why this takes 4 years when they already have a register and everyone should be on it not only the people in the picture! Makes you wonder about some of their interests from what I heard on the rumour mill.. Very good Peter I like the idea of transparency and judges! Thing is whoever writes this register is going to have to be completely independent and nothing to do with the judiciary or any lawyer otherwise you know what is going to happen - the same as in sport where the so-called drug tests everyone poits to as honesty are now rubbish because a lot of so-called top athletes are being given secret passes to take whatever drugs they can get a doctor to say they need.Over and out! Will Carloway go along or do a Gill and say NONO?! 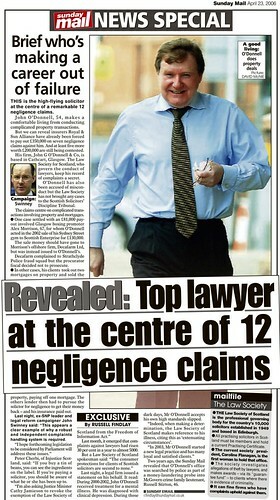 "Lord Gill’s roll of directorships fill out a page on their own, yet you get the feeling his name was only included in the 2016 version of the register to leave in some detail , mainly because if Brian Gill’s long list of interests were missing – as they should be, given Lord Gill left the role before the September 2015-16 period covered by the register - there would be little to read of the rest." 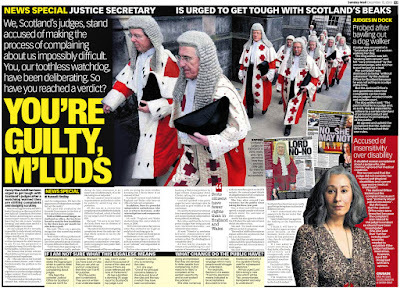 As you say all these years on such high salaries and so little to declare does not make sense.This is the same kind of statement judges hurl at anyone in the dock when faced with similar questions so give them a taste of their own medicine and make your register law for all the UK not just Scotland. Notice how the beeb replied to the Telegraph A BBC spokesman said that the “industry wide issue… affects those who have been engaged in this way for a number of different organisations”. I dont like that one bit.Anyone who dodges a question by saying everyone else is at it so why not us you have to wonder what is going on. Same for the judges in your story. Gill and Carloway come across all threatening in their testimony to msps and throw accusations around at everyone else to divert attention away from themselves.Hell they even managed to pull Sturgeon's strings to get her to mouth the exact same words.Proves they run her not the other way around.Not on.We are wiser to their tricks and now look at the state she has got us into. Back to the BBC comment disappointing to read the same BBC journos who talked our arm off to vote NO in the Indyref are tax dodging the very same UK they wanted us to stay with.Shocking or what. Any ideas on how many in the Scottish BBC are affected by this tax avoidance?Surely will be some at least! Who advises people on how to avoid tax? Lawyers and accountants.Who rubber stamps tax avoidance? Judges.If judges didn't rubber it wouldn't be happening. All comes back to the men at the top.Not too difficult to work out thanks to decent journos like yourself. Keep up the good work mister.You are one of us! Just to add to my earlier comment awaiting your moderation I went onto the telegraph website via the link on the BBC story and found the following.Thought you may be interested because the BBC are supposedly banning their journos traveling all over the place unlike the judges in your latest who are still doing holidays to Ireland and everywhere else with our money. Presenters of some of the BBC’s most popular news programmes will be banned from travelling overseas as part of plans to save £80 million from the corporation’s news budgets. New rules circulated to editors include a ban on shows such as Newsnight and BBC Breakfast deploying presenters to cover breaking international news, while newsreaders on the BBC News Channel will also no longer be sent on overseas trips. The new regulations, which will come into force after November’s US presidential election, have been brought in after the corporation admitted that it was wrong to have sent 17 reporters to cover one recent Brussels summit. Senior executives will now have to sign off all overseas deployments, to prevent staff doubling up on jobs. Viewers are used to seeing well-known presenters such as Huw Edwards and Fiona Bruce being flown out to host coverage of events such as the Paris terrorist attacks, but the rules state that there is “a perception held by parts of our audience that deploying presenters doesn’t add sufficiently to our journalism”. In future, each channel will only be allowed to send one presenter to major international events, with stars forbidden from having a “cosmetic presence” and told to work across a number of different programmes. Reporters who are covering stories on the ground will instead be asked to fill in as presenters, as the document calls on editors to manage “numbers and costs more effectively and more consistently”. The rules state: “The ability of the BBC to generate distinctive content is always a priority, but it needs to be balanced against the resulting total numbers. Under the new guidelines, presenters on the BBC News Channel, the Victoria Derbyshire programme, BBC Breakfast, Newsbeat and the Asian Network will be barred from overseas deployments. Newsnight presenters such as Kirsty Wark and Evan Davis will not be scrambled overseas for breaking news, with the programme’s reporters instead being given the chance to host the show on location. Hosts on the Today programme will only be deployed if there is “material editorial benefit”, such as essay-style pieces or interviews with high-profile figures, and they will have to extend their working day to broadcast on shows such as The World At One and PM. BBC sources said that the aim of the plans is to establish central control of international deployments, and prevent programme editors from sending presenters on “plain vanilla” news stories. 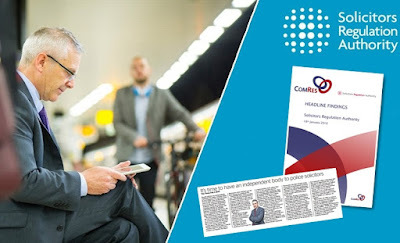 The corporation’s newsgathering arm has been tasked with finding £1 million in savings, alongside a cut of 10 per cent to the broadcaster’s domestic and international news channels. 20 October 2016 at 21:51 You can forget about independence Sturgeon wont win any new indyref She is no leader of any stature sounds like a whinger no matter what she says and will be lucky to pick up 35% even my daft as a brush 16 year old daughter cant stand her says we are going to have to stick with England as better having some family than no family at all Europe is no family to Scotland and with the trouble the SNP cause everywhere they go the EU dont want mad nats undermining Merkel and the Germans every time the SNP dont get their own way As for BBC I never watch it so if you have a problem just switch channels or switch off Everyone in my house watches the internet or you tube the tv is never on except for games! "Britain’s biggest banks are preparing to relocate out of the UK in the first few months of 2017 amid growing fears over the impending Brexit negotiations, while smaller banks are making plans to get out before Christmas." 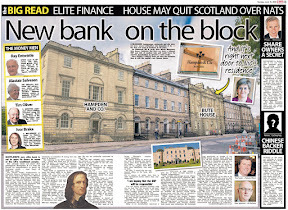 After all who in their right mind wants to deal with the corrupt Scottish Edinburgh lawyer banker mafia who refuse to allow any company or business flourish unless annual dues and tributes are paid to their mob! 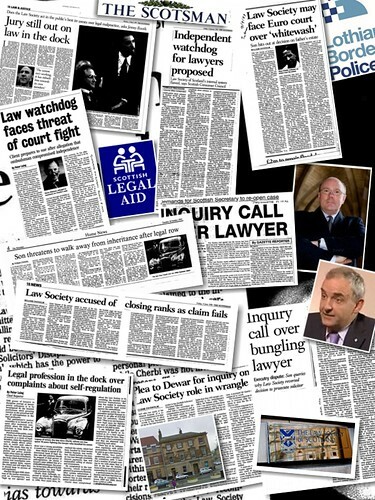 The intelligent among us are fully aware and understand media outlets who give lawyers and judges free PR do this for their own good not their readers or public at large in the same way the judiciary never rule on such a politically charged issue as minimum alcohol pricing without requiring a favour from Government or vested interests in return. The fanciful declarations of a handful of Scottish judges on their own version of the interests register are little more than a joke bordering on fabrication if the same rules of declaring assets and interests everyone else has to abide by are applied to the judiciary. How can someone earning hundreds of thousands of pounds a year in public money for two decades have nothing to declare.You rightfully point out this does not add up. If anyone be they a judge or whoever earn so much they accumulate assets property offers of other jobs and so on over a long period of time. No declarations and their openly hostile attitude to your petition and the parliament leads any reasonable person to conclude they are hiding their interests with deliberate intent.As deliberate as anyone in the process of committing or intending to commit fraud or other offences considered crimes if committed by the remaining 99.99% of the world's population. 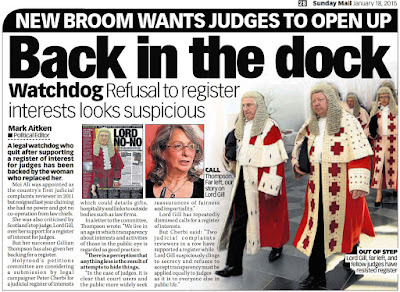 The judiciary's own register as published is as ridiculous as their court robes.MSPs must stop delaying and act to bring your register of judges interests into law.